Now that it’s officially October, I’m in the mood to add some more seasonal touches to my home. I put a poll up on my Facebook page last week asking which people would rather see: A.) my Fall home tour or B.) 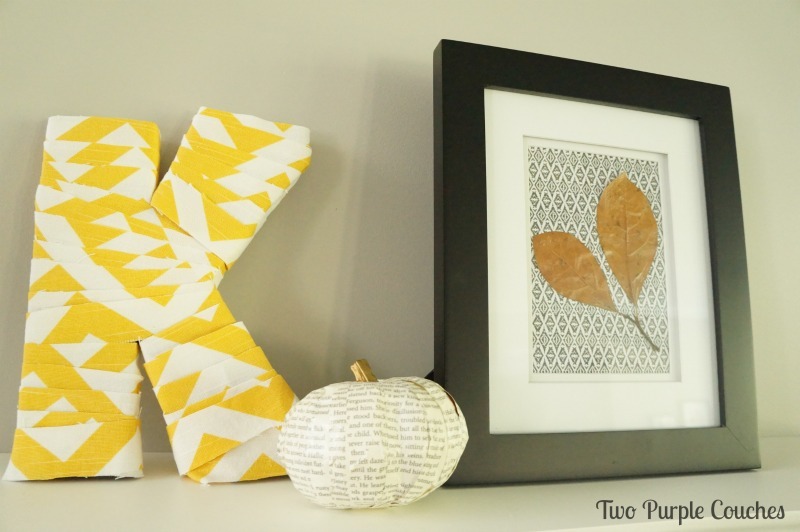 a simple Fall craft. B won by just a single vote! (Don’t worry, I’ll do a home tour too!). 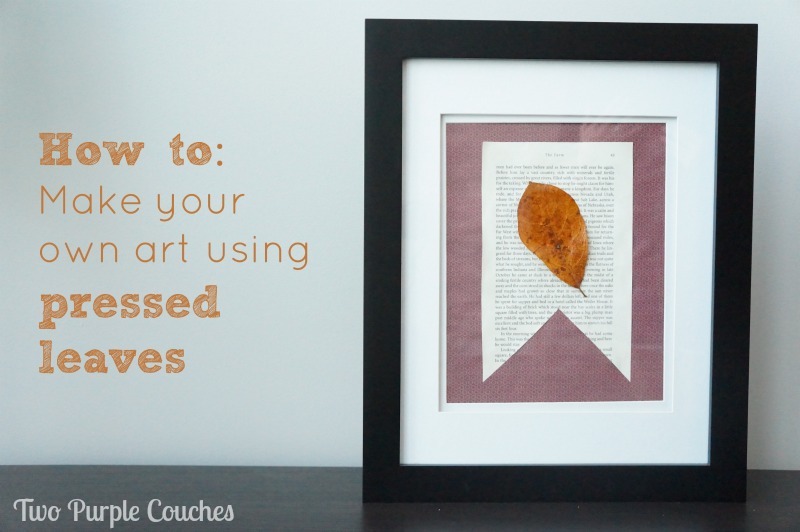 So today, I’m sharing a super simple craft to make your own Autumn-inspired art using pressed leaves. If I’m being honest, I struggle with decorating for Fall. I talked a bit about this when I shared my modern Fall mantel. The traditional color palette doesn’t suit my current style, and that leaves me feeling stumped at how to decorate my house. I like to change things up throughout the year, but come Fall, I’m not sure what to do short of covering my mantel in pumpkins and hoping for the best. This year, I’ve been looking to Nature for Fall decorating inspiration. Bringing in branches, bowls full of acorns and sprigs of cotton blossoms give my spaces a seasonal feel without overwhelming my style or usual color palette. So naturally (ha, see what I did there? 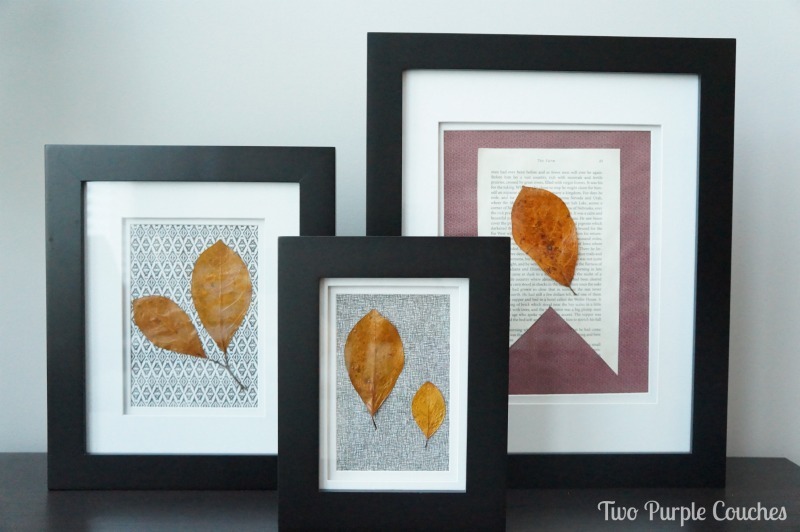 ), I was struck with the idea of creating some simple art using leaves. What’s more Fall-feeling than leaves? Plus, I love a good homemade art project. 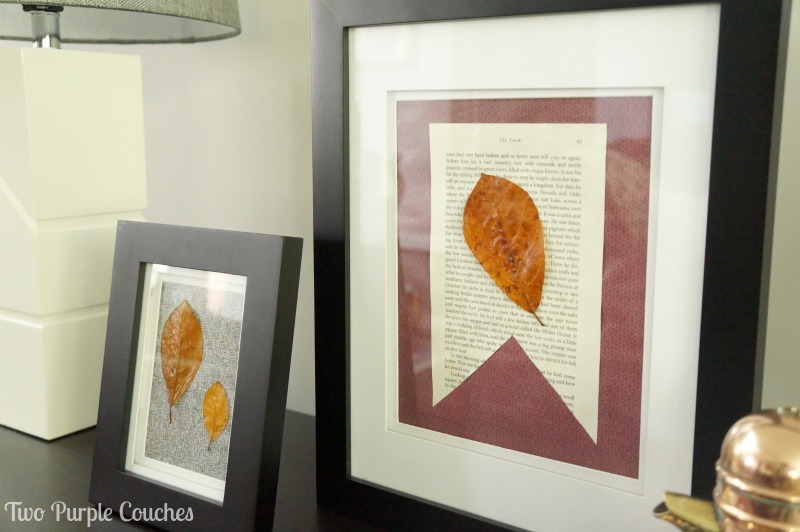 So my love of homemade art combined with my seasonal decorating struggle = this simple Autumn art project: Pressed Leaves Prints. 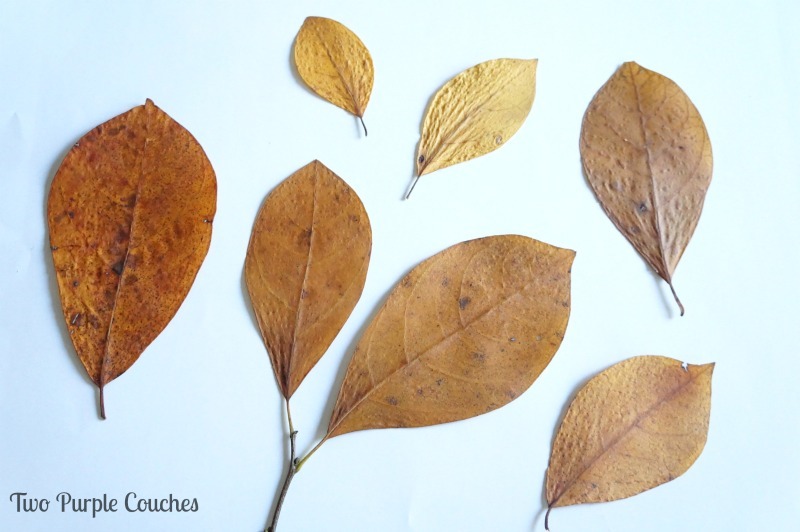 While I don’t have kids, I think kids would love this project since it involves hunting for leaves and glue. Kids love glue, right? I plucked these leaves right out of my own back yard. Not sure what kind they are, but I liked the shape. You could grab a bunch of the same type of leaf in different sizes, as I did, or mix it up with different types of leaves. Got your leaves ready? Now let’s get to pressing! Pressing leaves is pretty simple. Put them between a couple of book pages, preferably heavy hard-bound books, and leave them be for a few days to get good ‘n flat. 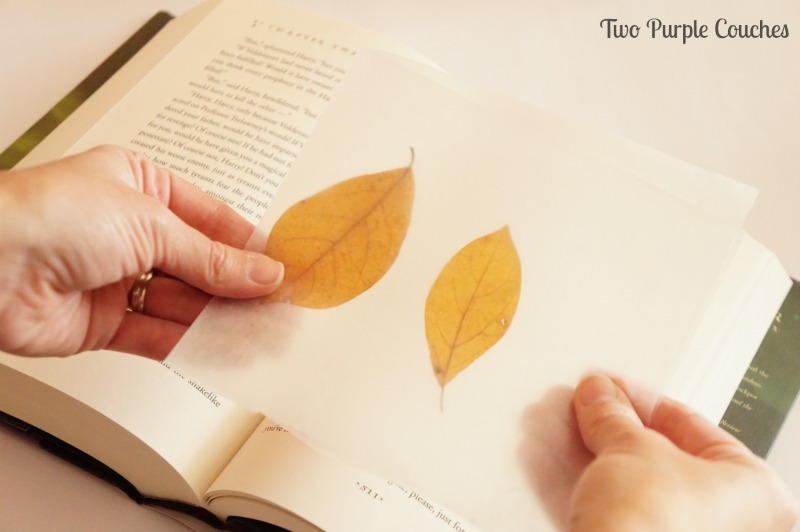 I tucked my sets of leaves inside folded sheets of wax paper before placing them in my books, just in case some weird color or something would rub off on the pages. – Gather some sheets of paper, could be book pages, sheet music, scrapbook paper, wallpaper scraps… Whatever tickles your art print fancy! 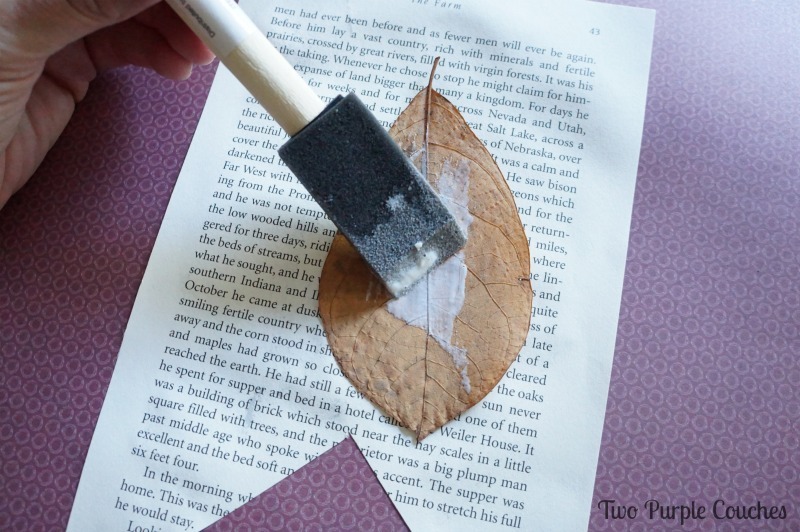 – Use Mod Podge to adhere the leaves to the paper, then give the whole thing a good coat. – Allow to fully dry (about an hour) before popping them into the frames of your choice. And that’s it! And instant art collection that’s practically free, assuming you have paper and frames on hand. Looking for more Fall decorating ideas and inspiration? Check out my Modern Fall Entryway Table and Mantel! This entry was posted in Made It Myself on October 2, 2014 by Two Purple Couches. Thank you Amanda! I’m loving the natural vibe & color they’ve added to my fall decor! With the leaves falling, this is a great project! Love the possibilities, and the fact that I have everything I need without leaving my yard. I am stopping by from the Work It Wednesday Link Party where I am linked up too with my Free Pintable – Say Boo Scare On project. So simple and just PERFECT for the season!